John and Brenda (Brathwaite) Romero will share their experiences in game design during a talk from 6:30 to 7:30 p.m. June 28 in the Golisano Hall auditorium at RIT. John and Brenda (Brathwaite) Romero have, together or separately, designed close to 200 games. From classic games such as Doom and Wizardry, to new social networks games such as Ravenwood Fair, this duo has helped to shape the gaming industry. The Romeros will share their experiences in game design and give insight into the future of the industry during a Q&A from 6:30 to 7:30 p.m. June 28 in the Golisano Hall auditorium at Rochester Institute of Technology. The talk is hosted by RIT’s MAGIC Center and the School of Interactive Games and Media, in partnership with The Strong’s International Center for the History of Electronic Games. 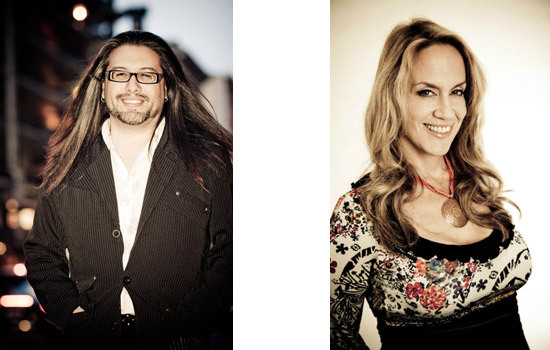 John and Brenda Romero have designed for numerous consoles, Apple IIe, PC, Facebook and mobile over their careers and across many different game genres. The Romeros also both serve on the advisory board of the International Center for the History of Electronic Games at The Strong. Award-winning game designer, artist and writer Brenda Romero is best known for her work on the Wizardry series of role-playing video games. She is the recipient of the 2013 Women in Games Lifetime Achievement Award awarded by Microsoft and was also named one of Forbes “12 Women in Gaming to Watch” in 2013. As an indie developer, game designer, programmer and artist, John Romero has published 107 games commercially, including Wolfenstein 3D, Doom, Dangerous Dave and Quake. His current areas of interest are Facebook games and massively multi-player online (MMO) games, as well as social media and its intersection with gaming. Tickets—$8.67 for students and $15 for the general public—are available online at www.eventbrite.com/event/7037257627. For additional event information, contact Professor Steve Jacobs at sxjics@rit.edu.